An important early mapping of the shoals off Nantucket. (A No. 2) Preliminary Sketch Showing the positions of Davis's South Shoal and Other Dangers recently Discovered by the Coast Survey and the sounding on the Old South Shoal, Bass Rip, Old Man, Pochuck Rip, &c.. 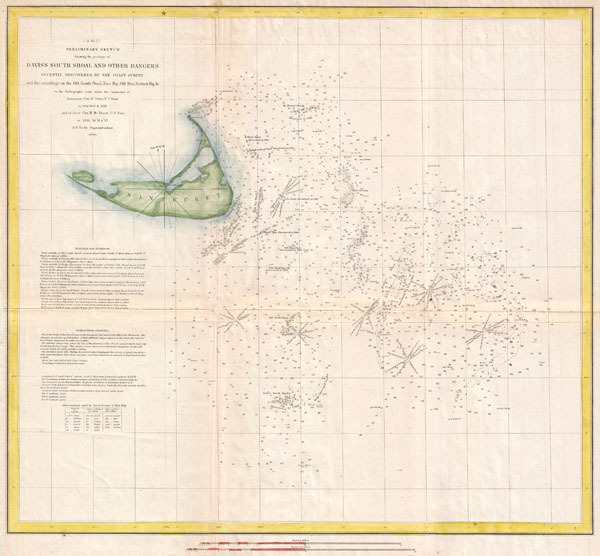 This map was created under the direction of A. D. Bache, Superintendent of the Survey of the Coast of the United States and one of the most influential American cartographers of the 19th century. The hydrography for this map was accomplished by a party under the command of Cha. H. Davis in 1846-48 and Charles H. Mc. Blair in 1849-52. Published in the 1853 Superintendent's Report. Very good. Overall age toning, expecially at folds and fold intersections. Several minor verso repairs and reinforcement.